Before the ACA, women were routinely denied health coverage due to a variety of pre-existing conditions. Some states even allowed insurance companies to deny women coverage if they were survivors of domestic violence or had a C-section. Such exclusions left women either unable to obtain health care altogether or forced to pay out of pocket for necessary services. The new repeal plan would gut protections the ACA put in place for people with pre-existing conditions. 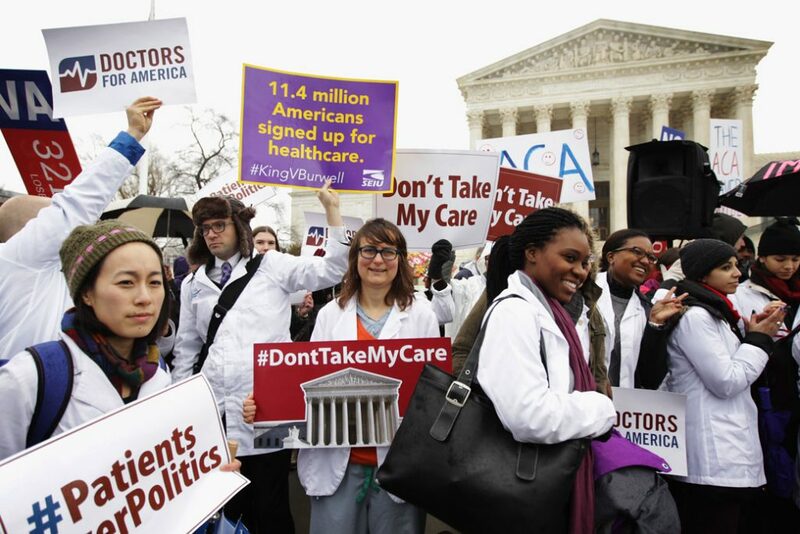 It would repeal key pieces of the ACA prohibiting insurance companies from charging higher premiums based on pre-existing conditions; requiring essential health benefits, such as maternity care; limiting the difference in how much insurance companies can charge older and younger people; and prohibiting lifetime and annual limits on essential benefits. More than 67 million women and girls have a pre-existing condition, and eliminating these protections means that women and girls in every state could be denied coverage or charged more. The Center for American Progress and National Partnership for Women & Families estimated the state-by-state numbers of women and girls with pre-existing conditions as well as the number of pregnant women, as pregnancy was a reason a woman could be denied health insurance before the ACA. * Without protections, many of these women wouldn’t be able to buy health coverage and others could be charged much more for pre-existing conditions. The Center for American Progress previously estimated that a 40-year-old would see premiums rise by $28,660 for breast cancer, $17,320 for pregnancy, and $20,450 for opioid addiction. One of the key consumer protections in the ACA was guaranteed coverage of essential health benefits including key services for women such as maternity care, prescription drugs, and mental health and substance use disorder services. The Graham Cassidy 2.0 plan would repeal these essential health benefit protections. Women rely on coverage of these important services to ensure that they can obtain the health care they need at an affordable price. Before the ACA, maternity care in the individual market was hard to find and very expensive. For instance, one analysis found that only 12 percent of plans included comprehensive maternity coverage. Now women, including women of color, are better able to access the health care services they need around pregnancy and maternity care, helping to keep women and babies healthy. However, much more must be done to address—and begin to close—disparities in maternal and infant health and mortality. The Graham-Cassidy 2.0 repeal plan would get rid of Medicaid expansion and the ACA marketplace subsidies, replacing them with block grants that greatly reduce funding for low-income families. Some of the money cut would also be used to expand health savings accounts (HSAs), a tax break that primarily benefits higher-income individuals. Millions of women rely on both Medicaid expansion and marketplace subsidies to access and afford needed health care. As explained in a previous CAP column, half of the amount of the plan’s inadequate block grants must be used for private insurance, meaning states will be limited in providing health insurance to people through Medicaid. The plan also requires that states offer private insurance vouchers to enrollees in Medicaid and the Children’s Health Insurance Program (CHIP), programs which have much lower cost-sharing than typical private coverage options. Millions of people have gained coverage under Medicaid expansion, with more becoming eligible as states such as Virginia pass expansion. In 2018, more than 6.3 million women and girls also received coverage from the ACA marketplace—most getting financial assistance in the form of premium tax credits and cost-sharing reductions. These programs are incredibly important to women in every state, including women of color, low-income women, and immigrant women, who need affordable health coverage to protect their health and access needed health care services. Cutting such programs through block grants would leave many women unable to get the care they need. The Graham-Cassidy 2.0 plan also includes language further restricting coverage of comprehensive reproductive health services. Unfortunately, the Hyde Amendment already denies coverage of abortion to women who receive health coverage through Medicaid. The Graham-Cassidy 2.0 plan would run the block grants to states through the CHIP program, which contains restrictions on abortion coverage. This means that this money could not be used to help purchase a health care plan that includes abortion coverage, except in limited circumstances, essentially expanding Hyde restrictions into the private insurance market. Insurance companies would likely drop coverage for abortion services from their plans. Together, restrictions on both public and private insurance coverage would make it even harder for women to access abortion and comprehensive reproductive health services. Millions more people have access to health coverage since passage of the ACA. Given the extreme cuts in the Graham-Cassidy 2.0 repeal bill, as well as the elimination of essential health benefits and pre-existing conditions protections, this plan would result in millions of women and families losing health care coverage. Time and again, people across the country have said they do not want to lose their health care. Policymakers must listen and expand access to health coverage and services—rather than taking it away. Theresa Chalhoub is a senior policy analyst for Health Policy and the Women’s Initiative at the Center for American Progress. *To download the tables with the estimated number of women and girls with pre-existing conditions and estimated number of pregnancies by state, click here.